Publisher's summary: After serving out a year of hard labor in the salt mines of Endovier for her crimes, 18-year-old assassin Celaena Sardothien is dragged before the Crown Prince. Prince Dorian offers her her freedom on one condition: she must act as his champion in a competition to find a new royal assassin. 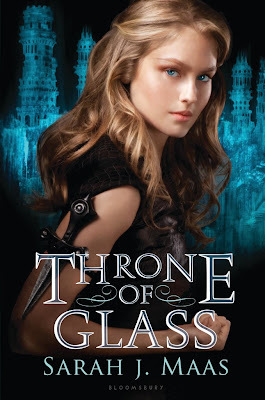 My take: From the very first chapter, I was intrigued with Throne of Glass. Celaena, a fearless, imprisoned assassin, is offered a one-shot deal to win her freedom by competing against 23 other criminals in a competition to find a new royal assassin. What I think intrigued me the most was that I was going to be in the head of this indomitable assassin. But I want to give you a heads up – I’m having a really hard time trying to find the words to adequately express how I feel about this book. For the first half of the book, I think I had really high expectations of how I thought the story would somehow play out; and even though I was kept entertained for that first half, I still thought there would be more action. It even got to the point where I was thinking the story wasn’t progressing or moving along even close to the way I thought it should. So, I ended up putting the book down for a day and then going back without any expectations. And from the very exact page where I started reading again, I was hooked for the remainder of the book. I think the strongest trait of this book was the complex characters and how well they were developed by Sarah J. Maas. I absolutely love Celaena as a heroine. And even though we don’t see a whole lot of her frightening assassin side throughout the book, you do find out that she has this crazy, awesome reputation of being an assassin you just wouldn’t want to mess with. I also absolutely love both Prince Dorian and Choal, the Captain of the Guard. There’s one other character that comes into the story (a princess named Nehemia) who I just adored as well. Most of all, it was the interaction between the characters that makes this book a lot of fun to read. I’m still not quite sure if there really is a love triangle going on between Celaena, Prince Dorian and Choal, but if so I’m torn about this one. For some reason, I have a major soft spot for Choal, and for some reason I think he’s probably better for Celaena than Prince Dorian. But a lot of my favorite scenes are actually interactions between Prince Dorian and Celaena. Pretty early on we learn that the world where this story takes place use to have a lot of magical elements to it, so I had high hopes from the beginning that we would see some fantastic fantasy elements. Unfortunately, you discover that the king has destroyed ALL magic in his kingdom. I won’t say if we see any magic in this book, but I will say that I have high hopes that we will see a lot of magical elements in Sarah’s future books in this series. The end to this book was really crazy. Nearing the end, there were moments when I feared a tragic betrayal and wondered how the story would end, but the real ending was pretty awesome and has me super excited to see what will happen next to Celaena! And now, after reading this one, I’ve found that there are 4 short stories/prequels to this book, so I purchased them all since they are currently only $0.99, and I’m really looking forward to reading those as well. Make sure you come back to here to Magical Urban Fantasy Reads this Thursday for Sarah J. Maas’ blog tour stop! There has been so much hype surrounding this book that I have been afraid of it. I am always worried when there is too much hype that my expectations will be too high and I will be let down. I am glad that this ended up being really good. I will get to it sometime for sure after reading your review!! I read all 4 novella's before starting this the other day (for the tour) and I think if you read the novella's you get a great backstory as well as action, the novella's didn't disappoint me, and I loved learning about Celeana's life. Great review, and hopefully this book will live up to my expectations! Ahhh! Can’t wait for this one! I love cinderella and heroines and assassins and Maas seems awesome. I’m buying this tomorrow! Thanks for the review!